A separate public hearing for each service district will be held on May 6, 2019 during the regular Board of Commissioners meeting, which begins at 6:00 p.m. in the Historic Courthouse. Please visit www.CurrituckInfo.com for information, community meeting dates, maps, and and an online public survey for each of these four service district proposals. Currituck County recognizes the efforts and excellence of its award-winning 911 Communications staff during National Public Safety Telecommunicators Week, April 14 – 20, 2019. The men and women who serve as emergency dispatchers provide a critical service for the county for 24 hours each day, 365 days per year. Telecommunicators provide an important link between citizens in need of help and the various first responders in Currituck County. Each telecommunicator is trained to receive information and dispatch personnel from the appropriate agency. They also provide basic first aid instructions, including CPR, to callers while emergency responders are in route to the scene. In recent years, Currituck 911 has received numerous awards from the North Carolina Chapter of the National Emergency Number Association. Individual awards won by staff members have included Communications Director of the Year, Supervisor of the Year, Training Officer of the Year, and Telecommunicator of the Year for the state. In 2010, Currituck was named the 911 Call Center of the Year in North Carolina. Currituck 911, which is part of the Emergency Management Department, uses advanced technology to dispatch aid as quickly as possible and inform responders of the situation. The features in the 911 Center include a computer-aided dispatch system that uses GPS technology to help pinpoint a caller’s location. This system links Currituck to various response agencies at the local, state, and federal levels. Currituck County can also receive text messages to 911 from citizens’ cell phones. Also, the staff is able to communicate with callers who do not speak English or who may be hearing or speech impaired. The 911 staff also offers a free “Are You O.K. ?” service for county residents. In this, a 911 dispatcher will call a resident each day at a certain time to check on them. This is very useful for senior citizens, anyone with medical concerns, or someone living alone. To register for this service, call the Communications office at 252-232-2216. You may learn more about 911 by reading these Frequently Asked Questions. At this time, Currituck County has a staff of one supervisor and 10 certified, professional telecommunicators. There are also two recent hires in the initial stages of training who will begin answering 911 calls in the coming weeks. Anyone who is interested in a career with Currituck 911 should contact the Human Resources Department for a job description and application. Voter registration deadline – April 5. Voters who wish to change their party affiliation must also do so by the voter registration deadline. In the Primary Election, voters are required to vote the ballot of the party they are registered with. Unaffiliated voters may choose their ballot when they present to vote. To check your voter registration, visit. www.ncsbe.gov or call the Board of Elections office at 252-232-2525. Absentee-by-mail voting begins March 15. Absentee ballots must be returned to the Board of Elections by Election Day. One-Stop early voting may be done at the Currituck Board of Elections office. The One-Stop voting period will be April 10 – 26. The hours are as follows: Monday-Friday, 7:00 a.m. – 7:00 p.m. On Saturday, April 13 and Saturday, April 20, the hours will be 9:00 a.m. – 3:00 p.m. Voters who are not registered by the April 5 deadline may register and vote during the One-Stop voting period. On April 30, all voting precincts will be open from 6:30 a.m. to 7:30 p.m. for the Primary Election. List of candidates who have filed for the Primary Election. Absentee-by-mail voting begins May 24. One-Stop voting period will be June 19 – July 6. On July 9, all voting precincts will be open from 6:30 a.m. to 7:30 p.m.
For more information, contact the Currituck County Board of Elections at 252-232-2525. Currituck County is working with Dare County and other partners to develop an updated hazard mitigation plan. The Outer Banks Regional Hazard Mitigation Plan will identify and assess the community’s natural hazard risks and determine how to best minimize or manage those risks. Public participation is a valuable component of this process. A public survey is an important tool in this planning process. This survey may be completed online and only takes a few minutes. It allows citizens an opportunity to provide opinions on natural risks facing Currituck County. The public will also be invited to community meetings during the plan’s development. Notices for these meetings will be placed on the project website and advertised by Currituck County. For more information, contact Currituck County Emergency Management at 252-232-2115. “March for Meals” is a month-long, national campaign to generate public awareness of senior citizen hunger and isolation, and to celebrate the valuable services provided by the senior nutrition program. Part of this program is delivering meals to seniors who may lack transportation or are confined to their homes because of medical conditions. Anyone who would like to learn more about this program, or volunteer to deliver meals, should contact Stacy Joseph at the Currituck Senior Center, 252-232-3505. 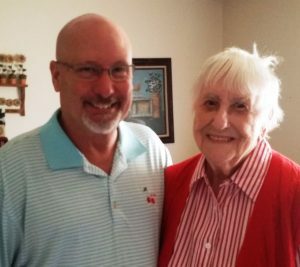 A special thank you goes out to North Carolina Rep. Bobby Hanig, who on March 15 hand-delivered meals to senior citizens during a visit to Currituck. Hanig is a former chairman of the county’s Board of Commissioners. 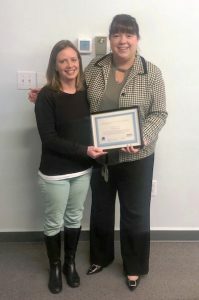 Two members of the Currituck County Department of Social Services were recognized on Feb. 22, 2019 for their excellent work with the foster care program. 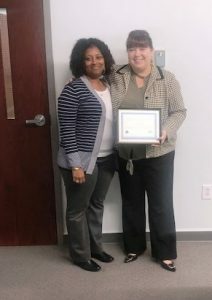 Kristen Harris, Social Worker, and Tyeshia Brothers-Phelps, Supervisor, received commendations from Samantha Hurd, Currituck DSS Director, for a successful child welfare audit conducted by the NC Dept. of Health and Human Services. Currituck was recognized for high performance in the safety, permanence, and well-being in the foster care casework. Congratulations to both ladies, and thank you to all DSS staff for the work they do in our community! Currituck County received notification of a $1 million grant from the Golden Leaf Foundation to help fund an expansion of the Moyock wastewater treatment plant. This expansion will increase the plant’s capacity from a current level of 99,000 gpd (gallons per day) to 300,000 gpd. Construction of the expansion is expected to be completed by the end of 2020. 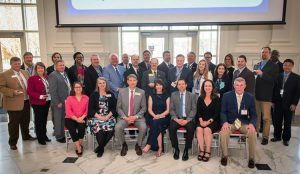 Read more about the Golden Leaf grant and expansion project on ThinkCurrituck, the county’s Economic Development website. Currituck County has been selected to host the 2019 Tarheel Softball State Tournament this summer! From July 18-21, tournament games will be held at the Parks and Recreation complex at Community Park in Barco. A total of 32 youth softball teams from all parts of the state are expected to converge on Currituck County, bringing hundreds of players, coaches, family members, and fans to the area. Four age groups will compete for championships, including 8U (8 and under), 10U, 12U, and 15U. Currituck County expects to have teams entered in the 8U and 10U divisions as automatic bids from the host county. The Tarheel Softball League divides the state into seven districts, with the winner of each district invited to the state tournament. Opening ceremonies for the Tarheel State Tournament will be held on Thursday, July 18. The public is invited to come out and support our local teams while enjoying the large tournament-style atmosphere in Community Park. 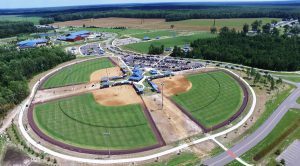 With a busy tournament schedule for 2019, Currituck’s baseball and softball complex continues to bring more people to Currituck, provides a boost for local businesses, and increases the exposure of potential guests for the tourism industry. For more information on upcoming tournaments, contact Currituck Parks and Recreation at 252-232-3007.